Mini-Golf Build and Food Donation is a fun, socially responsible activity fueled by teamwork. 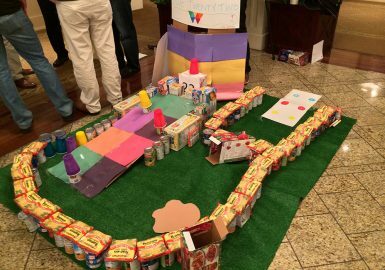 In this program, your group is required to design and build unique, one-of-a-kind mini golf holes to create one big miniature golf course where all participants will play when completed. Green carpeting is provided as the putting surface and canned goods, boxed goods, and other building materials are provided to create bumpers, turns, and special obstacle challenges. 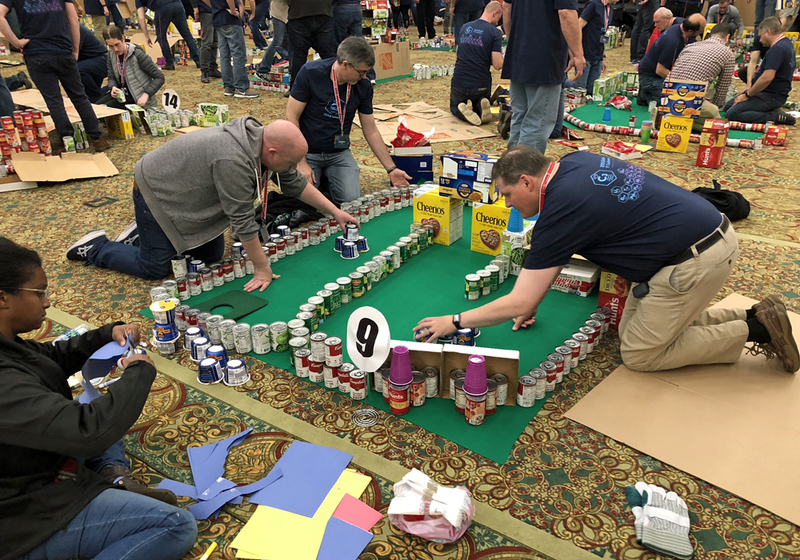 Creativity, resource management, and teamwork all come into play in this engaging charity event. After a fun energetic icebreaker to get everyone in a sporting mood, your group will be formed into golf teams. Each team is then tasked with building a unique mini-golf hole. 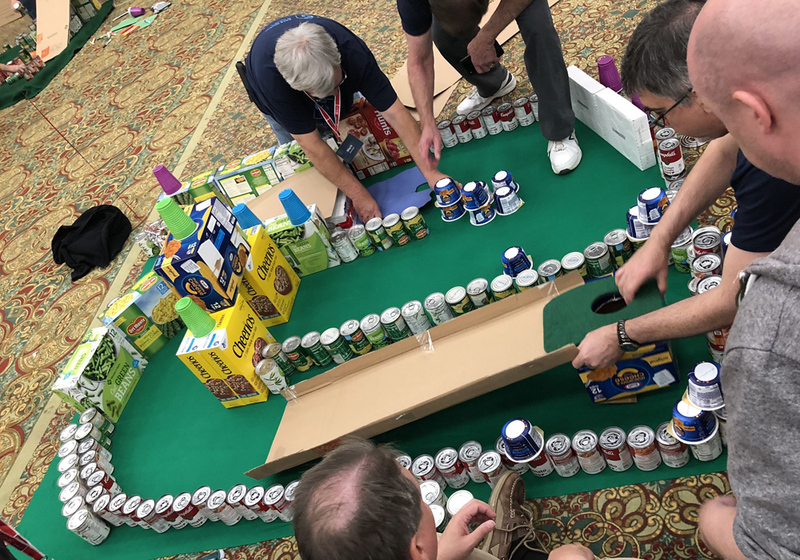 Teammates will work together on the concept, construction, theme, and rules of their hole as well as choosing various roles such as golfers, scorekeepers, and course officials. With officials ensuring that the rules of each hole are adhered to, the competition begins! Both newcomers and experienced golfers can enjoy this fun event and the winning team will be anyone’s guess! Once the tournament is complete, the groceries will be boxed and presented to a local food bank. Your team will feel a sense of accomplishment and the joy that comes from giving to those less fortunate. Whenever possible, a representative from the food bank, soup kitchen, or organization receiving your donation will address your group and thank them for their generosity. 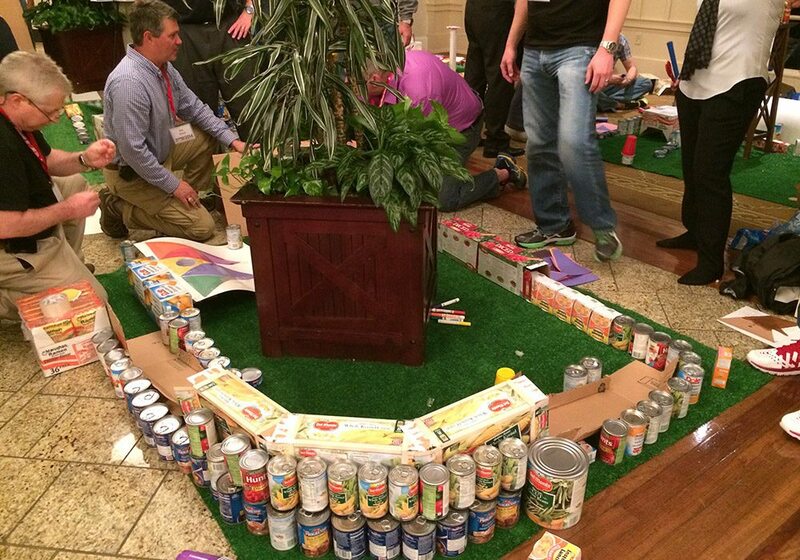 We were extremely satisfied with the way our Charity Mini-Golf Course Build was organized. The icebreaker and the golf course build were great team builders. Everyone was very happy with everything, from icebreaker to donation. Playing the completed golf course was the most fun. Your lead facilitator was excellent, this was our second year with him and he knows how to keep our group happy and engaged. Well done! Jessica, Kennedy Health Systems, Inc. When the 6,000 pounds of food was donated, the director pulled me aside and said, 'We had a meeting 3 weeks ago and came to the tough realization that this fall we would not have enough food to feed all the needy families of Las Vegas in our neediest time between Thanksgiving and Christmas. In one amazing effort, you guys have solved that problem. Thank you! Your Charity Golf Course Build team building program was one of the most unique giving-back programs we have ever done. 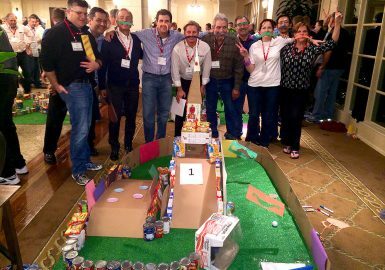 Fun, creative, competitive and philanthropic! It was a very nice twist of competition and caring. 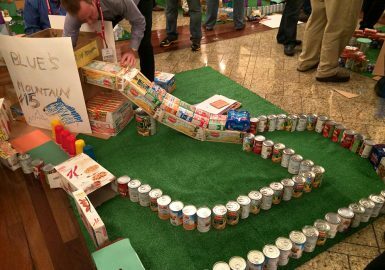 Thank you for contacting the White Center Food Bank to be the recipient of food donation from the Best Corporate Events Charity Mini-Golf exercise at Cedarbrook Lodge. It was great meeting you and seeing the creative program you organized. The generous donation of 633 pounds of food will help feed hungry families and is greatly appreciated. On behalf of the White Center Food Bank, and all the people that have received help because of your generous donation, we thank you! Your Las Vegas lead facilitator has been great to work with over the past couple years. Our group really enjoyed him hosting our Charity Mini-Golf Course Build™ event. Best Corporate Events has done a great job for us over the years. Keep up the great work! 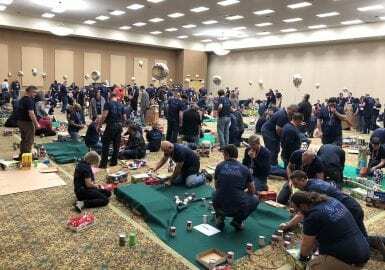 Our Charity Miniature Golf Course Build event went well. Everyone that attended enjoyed it. Thanks again for your assistance. We look forward to having other events in the future with you. 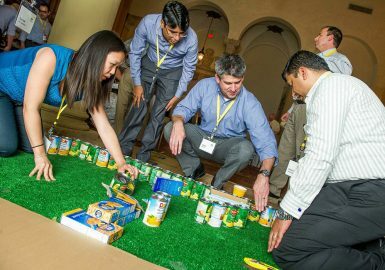 Best Corporate Events was very responsive with our questions about the Charity Mini-Golf Course Build program. The event was well organized and I thought the lead facilitator was excellent and really got the group going. Your two leads did an amazing job facilitating our Charity Mini Golf Course Build program. We had a great event and would highly recommend them for future events. They kept things flowing and were very engaging when they addressed the attendees. The whole aspect of the golf course building was a great team building activity! It was really well organized and we always love the icebreaker games before we start. Our group enjoyed the programs activities and all the food that was donated. Great Job on every part! Wanted to say thank you to both you and Best Corporate Events for organizing on short notice and MC-ing the event tonight. Your facilitator did a great job and our teams had a great time. It was obvious the impact the program had on our company. We will definitely keep you in mind for any other events we have planned in the future. We had a great experience last year with your team, so we were interested in possibly working together again. The program you delivered this year, a Charity Mini-Golf Course Build, went great. It is really refreshing to work with all the same people again this year. It’s so rare, but really makes me glad that we can work with your company again and again! Our Mini Golf event was fun because every hole was different and so folks got to try other holes. The program seemed very well received by our group. The best “team building” aspect of the program was not knowing what we were going to do and then having to work together to come up with an idea and then executing it. Your presenter and supporting staff were great in their interactions with our group and were very pleasant to work with. Ann, W.L. Gore & Associates, Inc. Thank you for a wonderful fun-filled event today. Your lead facilitator certainly had a way of getting everyone engaged and excited about the afternoon. Our team had an amazing time and still talking about each other’s golf challenge. Very nice to have worked with your company and hope that we have the opportunity to work with your organization again in the future. Mixing the groups so that the interns worked with different people than they are used to was a great team builder, as was working together creatively with limited resources. The most fun was seeing the interns proud of their work and presenting together. They enjoyed it! Something different for them and they liked being creative. I noticed there was a shift in energy to being more positive and engaged with this activity closing the day after lots of sessions. Your facilitator was great and I enjoyed working with Pam as the primary contact for our local charity. Our Mini-Golf Build was very organized. Our team leader was awesome! She kept the energy and interest levels high Working together in small groups to problem-solve was a great teambuilding exercise. Our group enjoyed the activities and charitable aspect of the program. They were major highlights of the event. The most fun was giving all the canned and boxed goods away to charity at the end. The event turned out really well and everyone enjoyed it. 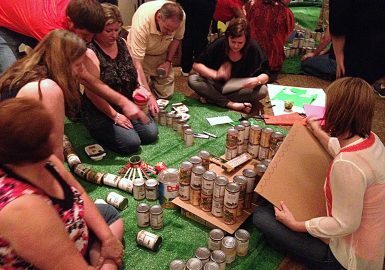 Our Mini-Golf Build and Food Donation is an extremely organized event. The teams working together to design and construct their mini golf holes turned out to be a great team builder. Everything we did in the program was fun! They really enjoyed themselves and having the opportunity to contribute to the community. Jenita, Citizens Property Insurance Corp.
25 sq. ft. per person. The activity space must be a level surface. Pricing varies depending upon the number of participants (minimum of 30) and includes canned and boxed goods, complete event coordination, program design, facilitators, master of ceremonies, building stations, materials and supplies, indoor/outdoor carpet, boxes, construction paper, team packets, and coordination with the donation.